Peel and wash the beets and then cut them in half or quarters (depending on size) so they are uniform in size. Place beets on a rimmed baking sheet. Toss beets with olive oil and 1/2 teaspoon salt. Roast in preheated oven until tender when pierced, about 20-30 minutes. Let cool about 15 minutes. In a blender, place grapeseed (or olive) oil, shallots, 3 tablespoons water, cilantro, vinegar, and remaining 3/4 teaspoon salt. Process until blended, about 5 seconds. Add beets, and process until desired smoothness, stopping to scrape down sides as needed. Add additional water as needed to get a semi-smooth purée. Stir in black pepper. Remove tops from carrots, reserving 1/4 cup for garnish if desired. Discard remaining tops or reserve for another use. Cut any large carrots in half so they are all roughly the same size. Spread the carrots in a single layer on a rimmed baking sheet. Toss carrots with olive oil, salt, and pepper. Roast in preheated oven until carrots are browned in spots and tender, about 20 minutes, stirring once halfway through cooking. While carrots roast, melt butter in a medium saucepan over medium heat. Continue cooking, stirring often, until butter browns and smells nutty, 5-10 minutes. Remove butter from heat, and let cool 1 minute. Stir in hazelnuts (or almonds), sherry vinegar, lemon juice, and salt and pepper to taste. Be careful when doing this as the vinegar and lemon juice will cause the hot butter to foam up momentarily. Spread a generous dollop of beet puree in the center of a large salad plate. Arrange some carrots on top and drizzle with about 1 tablespoon of browned butter. 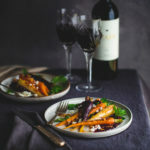 Crumble or shave some goat cheese over the carrots. Then garnish with cilantro leaves and reserved carrot tops. Repeat with remaining servings. The original recipe called for adding some water and covering the beets with foil when roasting them. I prefer to roast the beets uncovered for a deeper flavor. This does dry out the beets a bit more thus the need for the extra water. My blender also isn’t super powerful so I need the extra liquid to get the purée smooth. I blend it until it is the consistency of hummus. The original recipe called for 1 1/2 pounds of carrots with tops. The tops are mostly used as garnish so don’t worry if you can’t find carrots with tops. I also found that 1 1/2 pounds didn’t yield enough roasted carrots for my taste. The 2 pounds of carrots stated in the recipe is 2 pounds without tops. Recipe adapted from Food and Wine, January 2019.